These hats are high quality fur hats made from real muskrat for the Russian (or Canadian) winter. They are well made, very warm, and very fashionable! 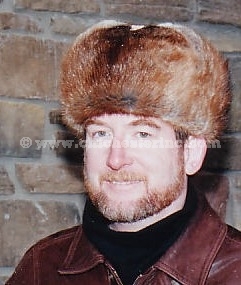 The Russian-style fur hats are lined and made from high quality Canadian muskrat fur. The ear flaps can be worn up or down depending on the weather. These hats will keep you warm in the coldest weather. Genus and species: Ondatra zibethicus. Muskrat are not an endangered species and are not subject to CITES controls. These Natural Brown Muskrat Fur hats with leather tops have a black quilted lining and are made from high quality Canadian muskrat fur. The ear flaps can be worn up or down depending on the weather. These hats will keep you warm in the coldest weather. These Black Muskrat Fur hats with suede tops have a black quilted lining and are made from high quality Canadian muskrat fur. The ear flaps can be worn up or down depending on the weather. These hats will keep you warm in the coldest weather.